The brief for the project was to design a self-supporting structure not exceeding a height of 4 meters and area of 80 square meters based on the theme of “Energy”. It was to provide an inspirational structure or space where visiting architects, designers, families and the general public could stand, walk-through or seat around to admire, engage with each other to enjoy and share discussions about design or simply relax within the unique setting and space created by the Pavilion. 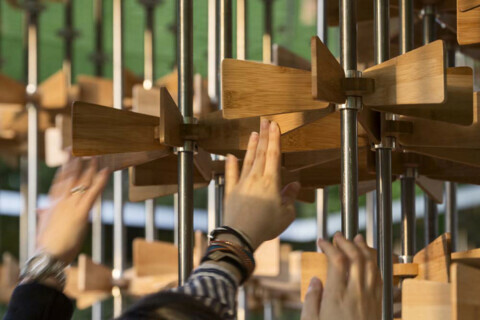 The project represents the exploration of potential energy that a single action in the community triggers. It reinterprets the notion of energy and supports the belief that people, regardless of race, gender, beliefs or identity are the most prominent force that propels both London’s achievements and communities alike. The individual is the single component necessary to trigger a grander action. 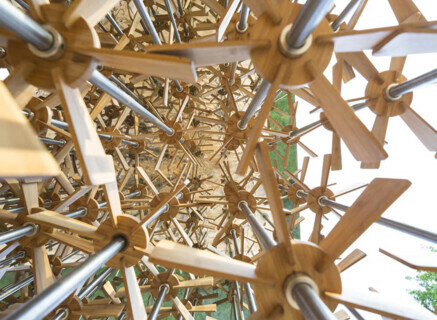 Inspired by the classic children’s toy, the pinwheel, the Pavilion is a catalogue of mills upheld by a forest of pillars. Each wheel is systematically aligned to the others on the rod pillar, so a spin of a single wheel triggers movement of the adjacent wheel signifying the idea that the action of a single individual triggers a chain reaction by a greater number, positively influencing the wider community. 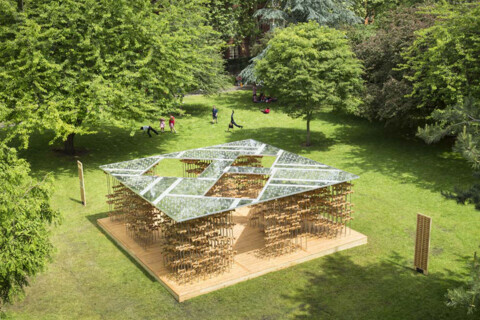 The eagerly anticipated 2016 Triumph Pavilion at the Museum Gardens in Bethnal Green, London E2 9PA, next to the Victoria and Albert (V&A) Museum of Childhood has now opened to the public with great applause. The Triumph Pavilion project is an annual showcase and on the whole a unique and exciting celebration of architecture and design. It encourages architectural experimentation and exploration including form, function and material. 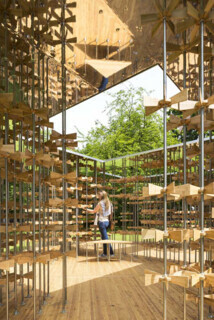 The Pavilion is also part of this year’s London Festival of Architecture. 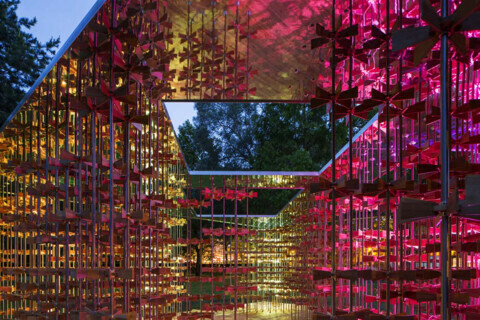 Designed by Five Line Projects a talented, dynamic young practice based in London who happen to be the youngest practice to win and be selected to design the Triumph Pavilion. The Pavilion was engineered by Arup. 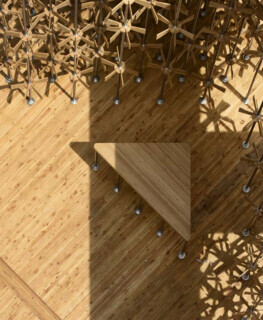 The theme for this year's Triumph Pavilion was energy, hence the title “Energy Pavilion” with community being the focus of the winning concept. 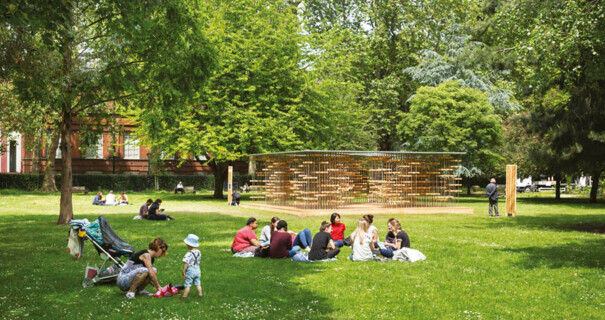 The brief called for the provision of an inspirational and engaging structure or space based on the theme of “energy” where visiting architects, designers, families and the general public can stand, walk-through or seat around to admire and engage with each other to enjoy and share discussions about design or simply relax within the unique setting and space created by the Pavilion. Five Line Projects clever and enchanting architectural design addresses the difficulty of a comprehensive definition of energy because of its many forms with an interpretation that very much takes the site into context, is inclusive, interactive and accessible. 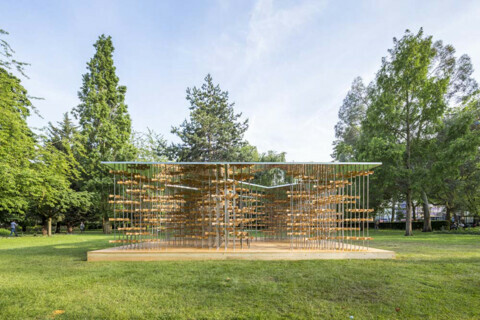 The Pavilion as a self-supporting structure measures approximately 2.75m in height and 64m² in area, constructed out of bamboo, stainless steel rods, timber, CLT panels and polished aluminium cladding. Supported by solid steel brackets, structured steel ground anchors with carbon steel heads, the entire structure weighs approximately 9,000 kg (9 tonnes). The Pavilion is to be enjoyed by both visitors to the Museum Gardens as well as those to the V&A Museum of Childhood with views afforded by the great south windows. 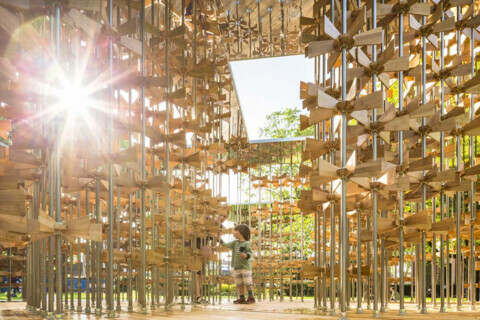 Inspired by the classic children’s toy, the pinwheel, the Pavilion is a catalogue of mills upheld by a forest of pillars. Each wheel is systematically aligned to the others on the rod pillar, so a spin of a single wheel triggers movement of the adjacent wheel signifying the idea that the action of a single individual triggers a chain reaction by a greater number, positively influencing the wider community. The Triumph Pavilion installation is an annual showcase organised by ArchTriumph to spotlight the work of an architect or design team. The team to design the year’s Triumph Pavilion is selected from an international open call to architects and designers to submit proposals based on a predefined theme. ArchTriumph recognises that design competitions are a core process of the architecture practice in the real world and offer architects the unique and vital platform to pitch for work, present ideas, compete with other architects or just to express a certain creative flare that is sometimes suppress in their normal practice, all adding to their portfolio. It believes that architecture has the power and capacity to influence the way a society views itself and functions. ArchTriumph hopes that a number of innovative architects will be discovered through its competitions, awards and showcases. Its competitions are open to individual or team of architects, graduate architects, students or teams of graduate architects, architects, designers, urban planners, landscape designers, engineers all of which have to collaborate with an architect for project realisation. Please see www.archtriumph.com for further information and details.